Kalpona Akter knows what she’s talking about when she describes the conditions of sweatshop workers in Bangladesh. After all, she started to work in one when she was just 12 years old. At 16, she was fired for her union activities and was blacklisted, which she challenged in court. She was then hired by the union and later became part of its leadership. 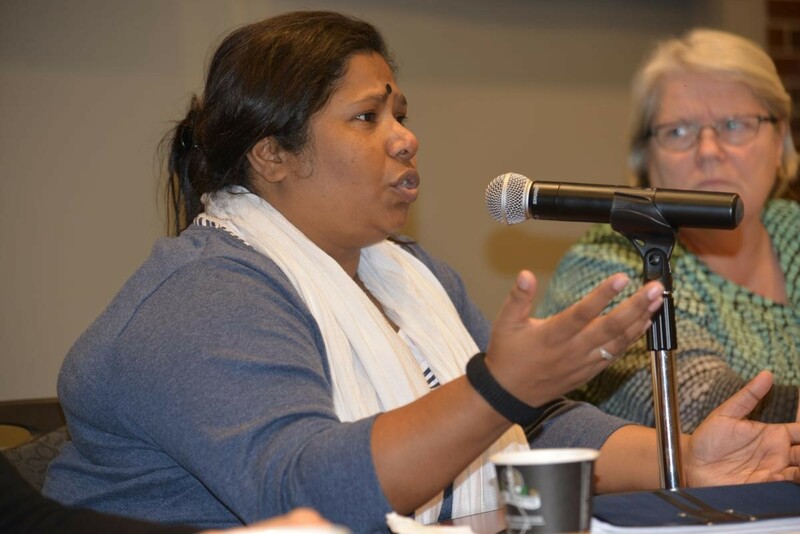 Now a seasoned labour activist, Kalpona is the executive director of the Bangladesh Center for Worker Solidarity, a labour organization she founded with two other former garment workers in 2001. Based in the Bangladeshi capital city of Dhaka, it conducts labour rights training and leadership education for garment workers and advocates for labour rights. Kalpona was in Ottawa in early December as part of a five-city tour in Canada to raise awareness about and garner support for BCWS’s advocacy work. Many of us have heard of the extreme results of the wretched working conditions of the garment workers in Bangladesh – the 1,100 who died in the Rana Plaza building collapse and the more than 100 killed in the Tazreen factory fire. The substandard workplace health and safety conditions are all due to the sweatshop owners’ drive to save on production costs and squeeze out maximum profits. One of the important objectives of Kalpona’s tour is to get labour and consumers to pressure the corporate giants in North America which outsource to garment factories in Bangladesh to sign onto the Accord on Fire and Safety in Bangladesh. To Kalpona and the BCWS, the strategy of boycotting sweatshop-made clothing is not the way to go. The Accord is legally binding and provides for independent factory inspections, democratically elected health and safety committees, health and safety workers and management training in which unions play a role, an anonymous complaint system and the right of workers to refuse unsafe work. Signatories can also be brought to court in their base countries. To date, more than 100 corporations in Europe, the United States, Australia, Hong Kong and Japan have signed the Accord. But only one – Loblaws/Joe Fresh -- in Canada. Kalpona’s tour in Canada was sponsored by the Maquila Solidarity Network, CUPE and the Public Service Alliance of Canada’s Social Justice Fund. Her visit is timely given the current Canadian labour movement’s struggle against the Harper government’s efforts to whittle down the occupational health and safety legislation that protects workers under federal jurisdiction. It is a good reminder that, through worker solidarity, even seemingly insurmountable odds can slowly be overcome.